With Canadian summers getting hotter and hotter the need for a comfortable space to beat the heat is more important than ever. In 2016 many parts of southern Ontario had more than 30 days of 30 degree or higher temperatures with the humidex making it feel even hotter, and 2018 was the same. In extreme temperatures, this can be dangerous for those in the vulnerable sector: the elderly, the young and those with breathing difficulties. Despite the risk, many feel they cannot afford to have an efficient and reliable gas furnace in their home because of the cost. Luckily, there is now an alternative to traditional financing which is making energy efficient cooling systems more attainable for the average homeowner. In fact, with a furnace or central air conditioner rental, as long as you are a home owner, you are likely to qualify to get a brand new system installed. Replacing older systems with energy efficient ones can not only save your money on your energy bills, but it also lowers the emissions you are putting into the air. Upgrading your systems can also qualify you for government rebates. In Ontario, you can qualify for up to $650 if you upgrade your heating and cooling systems with ENERGY STAR models. Our systems are not limited to residential spaces, a central air conditioning rental is also a great opportunity for business and property owners to take advantage of the many benefits of a rental agreement. 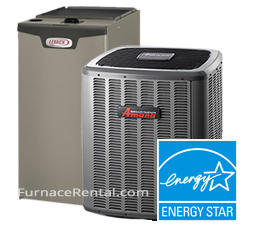 With a rent to own heating and cooling system you have the benefit of a fixed monthly cost. Instead of a large initial outlay and then unexpected costs, you have a fixed monthly amount. This helps to create and maintain a business budget. Property owners can build the cost easily into the rent charged to their tenants, so both parties are able to benefit. With your rental agreement comes the peace of mind with knowing you are covered. When you call to get your new system we can arrange free installation as soon as the next day. So you are able to enjoy your system right away. We can even remove your old system for you, at no cost. When it comes to maintaining your system, we are happy to come out and perform regular maintenance to make sure your system continues to keep your home cool all summer. If the unexpected does arise and your system stops functioning, with a rental agreement you are completely covered. Instead of wasting time and energy calling company after company to find the best price, you can contact us through our emergency phone number open seven days a week. We guarantee we are the best price since we are absolutely free! In fact, we expedite your service to get your cooling system working again as soon as possible. If for any reason we can’t fix your system we will replace it, for free! So what are you waiting for? Don’t spend another summer sweating it out and risking your health. Take control of you health and your home with an affordable central air conditioner rental today! Picture yourself surrounded by the natural wonders of the Kawarthas. Lush vegetation, beautiful beaches and an abundance of wildlife. With an ideal location along the Trent Severn Waterway, Peterborough is located within 500 miles (800 kilometers) of 60 per cent of Canada’s population and 40 per cent of the United States population. Peterborough also features the largest airport located between Toronto and Ottawa with a 7000 ft main runway. With two higher learning institutions, clean air and safe communities, Peterborough is not only a wonderful place to call home, but also a wonderful place for many tourists to make their homes away from home. Peterborough features many activities that are free for individuals and families. From the many beaches, to the Peterborough Zoo (runs on donations) free events at the Market Hall performing Arts Center and admission is free for kids under five for the Lang Pioneer Village Museum. The savings don’t have to end there for residents of Peterborough, those who want to be able to enjoy the inside of their homes as much as the activities going on outside can get a central air conditioner rental to stay cool all summer.